Ahead of the 22nd annual meeting of the Indian Ocean Tuna Commission (IOTC), WWF warns about the repeated failure of member states to implement the limits agreed to halt overfishing. Gland, Switzerland, 18 May 2018 - In advance of the 22nd annual meeting of the Indian Ocean Tuna Commission (IOTC), WWF has issued a warning about the repeated failure of member states to implement the limits agreed by the Commission to halt overfishing of a number of key stocks, including yellowfin and bigeye tuna, among others. WWF understands that despite previous commitments to progress a key mechanism to limit overfishing - the implementation of harvest control rules - this matter is unlikely to be tabled for agreement at its meeting from 21-25 May in Bangkok, Thailand. WWF would consider this unacceptable. “The IOTC cannot claim success at this important meeting unless it achieves an agreement to implement robust harvest control rules through specific work plans for each species. Without clear, agreed work plans, the harvest control measures will be hypothetical and toothless, and will not tackle overfishing. 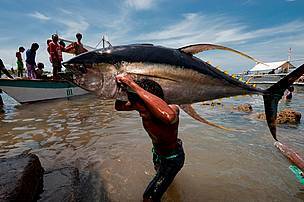 WWF urges members to the IOTC to agree to table the implementation of harvest control rules, otherwise it will be setting itself up to fail to manage the precious ocean resources it is responsible for,” said Umair Shahid, WWF’s Indian Ocean tuna spokesperson. The IOTC had agreed at its meeting in 2015 to develop work plans on the development of harvest strategies for key tuna stocks, like yellowfin tuna, which remain overfished. While some progress has been made to advance the work on development of harvest strategies by 2018 for yellowfin, bigeye, and albacore tunas, and for swordfish, there is no formal evidence of any progress of these resolutions. It has also been recognized that there is a need to refine the adopted skipjack tuna harvest strategy. “WWF is most concerned that continued overfishing of key stocks of tuna and billfish species causes serious harm to ocean-wide ecosystems, and places increased pressure on food security and livelihoods for many coastal communities around the Indian Ocean, spanning Africa to Asia. The IOTC needs to step up to its responsibilities to deliver the agreed management that can avoid this happening”. WWF is also seeking commitments from the IOTC to reduce unsustainable catches of many shark and ray species, and for member countries to meet sustainability obligations they have made, such as reduction of unsustainable trade and implementing stock recovery plans. As member states consider their obligations in preparation for this important meeting, WWF reminds them of the agreement to achieve the sustainable development goals, as they have committed to at the United Nations General Assembly in 2015, including: By 2020, effectively regulate harvesting and end overfishing, illegal, unreported and unregulated fishing and destructive fishing practices and implement science-based management plans, in order to restore fish stocks in the shortest time feasible, at least to levels that can produce maximum sustainable yield as determined by their biological characteristics.